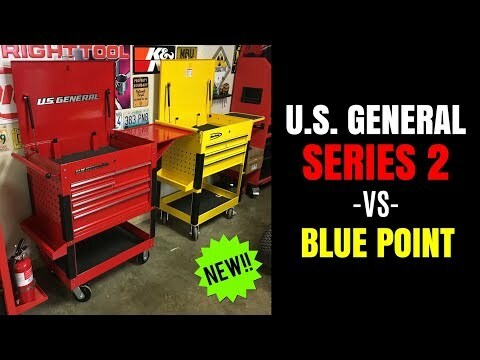 Here's an industrial grade U.S. General 5-drawer Mechanic’s Cart that doubles as rolling workstation with a built-in toolbox and five drawers. With quality features like rolled drawer edges, 90° gas struts on the lid and spring-loaded drawer latches to hold drawers shut, this cart is ideal for the master mechanic. Store over 15,000 cu. in. and 700 lb. worth of equipment. Four smooth heavy duty swivel casters provide easy movement around your work area. The durable glossy powder coat finish prevents rusting and looks great.